noted: If I had to do the same again, I would, my friend, fernando! If I had to do the same again, I would, my friend, fernando! With a little trip to Poole Park (that left me wanting to upgrade some of my glass.... anyone got a couple of spare grand??) this was my favourite little guy. 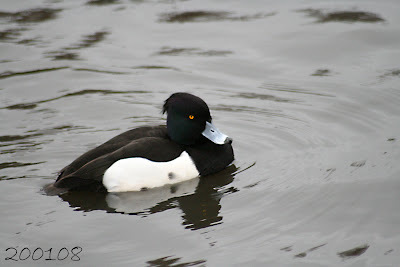 He's a tufted duck and reminded me of another special little tufty chap from Friday. After arriving at work at 8am, there was a sad little duck sitting in the middle of our car park (right in the path of the huge lorries! ), and after Nick and I tried to usher him out of the way we noticed that he had a poorly leg - the poor little mite was hopping along. Little Fernando (yes... we just had to name him!) decided the safest place to take sanctuary was under Nick's car! So after calling the RSPCA, while we were waiting we wondered if he might like to get his strength back with a little snack, and although we didn't have any bread, a bit of a plain sponge angel cake went down a treat. Later in the morning the RSPCA inspector arrived and after extracting him from under the car with a net, she seemed to think his prognosis was unsure - she thought his leg and maybe his wing was broken, but she promised to call us to let us know his outcome. After waiting all day, and even after trying to find out how he had fared, we were still none the wiser. So i'm hoping some news will be waiting on my voicemail in the morning at work... if not I won't be a fan of the RSPCA! So here's to Fernando!! This posts' for you! Have we heard anything about fernando? ?